The gold prize winner in this year’s JCD (Japanese Commercial Environment Designers Association) design awards for ‘communication design in the commercial environment’, Ben Nagaoka’s Yamakoya is a great example of creating space within a space. 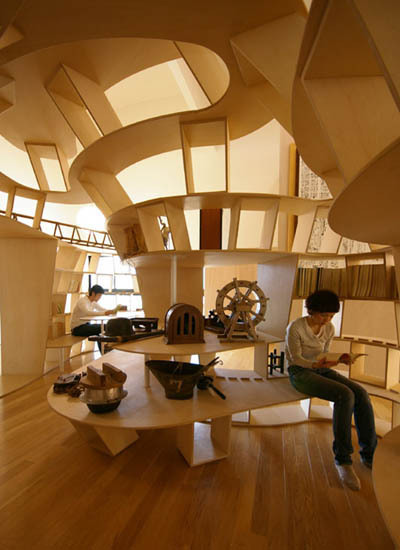 Yamakoya, which means ‘wood-log cabin’ in Japanese, is a structure designed specifically for private research focusing on local history within the Ina-Higashi Elementary School library in Japan. Built into the corner of the library, it comprises of open shelving, storage space, a 4-person table for group work and smaller private areas designated for individual study.